I’ve been telling myself that for the past 3 months. After brainstorming with rif and a few friends, I decided it was time to “take this blog to the next level.” Thus, food video blogging (VLOG). Ladies & gentlemen, Tuan-tuan & Puan-puan, Tan Sri & Puan Sri, Datuk & Datin, Ah Pek & Ah Moi… I present to you, my first food video blog! Thank you for watching. This will be a regular feature on my blog (not sure about the frequency), but I will try my best to vlog as often as possible. it'll be useful in the future.. if u really have your own show! That was really good. And educational. 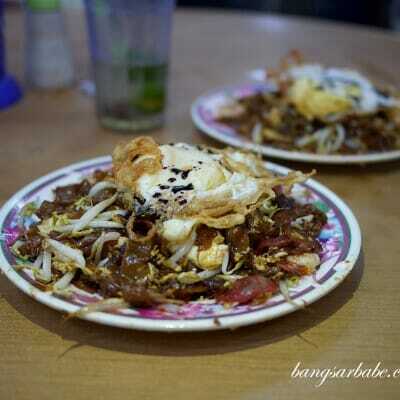 For example I learned not to get between you and a plate of Char Kuay Teow. good stuff! i remember i talked to someone 2 yrs ago n he said tat to differentiate, one must go to video..looks like u done it! great effort-a big step to success. Bravo! Nice production and direction. The CKT looks delicious. You can have your own TV food show. good stuff, love the Robert's CKT, very famous CKT …but i need high speed internet to view, dunno why my co. throttle it. Finally can see you in action 🙂 Your food posts always make me hungry. Definitely a wonderful change using a vlog. My feedback is that it sounds 'scripted', maybe make it more casual and relaxed? vialentino – You sure will! Joe – It wasn't easy, but I got the hang of it! FeeQ – Sorry, technical problem.